CIED investigates the drivers and barriers to low energy innovations throughout the economy and the implications of these innovations for energy demand. The TSU collaborates in this Research Centre on End Use Energy Demand which is funded by the RCUK Energy Programme. Walking and cycling are the most sustainable modes of transport in cities and should be placed at the heart of a transition towards low-carbon urban mobility systems. As part of the DePICT project, the TSU will investigate community-led infrastructure initiatives, aimed at increasing the attractiveness of walking and cycling in London. Sustainable Cities and Resilient Transport is a 2-year collaborative project which aims to enhance the research capabilities involved in future city transport planning, in both London and Manila, utilising the latest scientific research in practice. 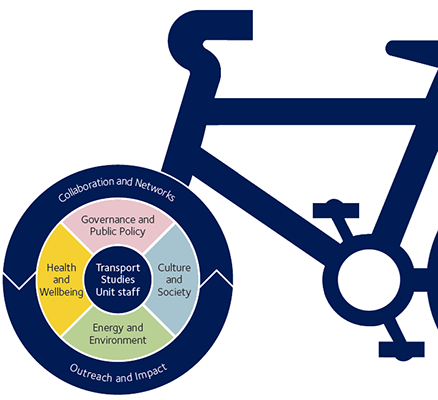 The EU-funded PASTA project aims to connect transport and health research and practice by promoting active mobility in cities (walking and cycling in combination with public transport) as an innovative way of integrating physical activity into our everyday lives. Interdisciplinarity is a key principle of the research undertaken by the TSU. We draw on relevant and state-of-the-art developments in a wide range of disciplines and we are strongly committed to work that transcends disciplinary boundaries. Our research across the four themes is also characterised by a strong orientation towards the future and by a focus on sustainability. The research conducted at the TSU addresses transport and mobility from different thematic, theoretical and methodological perspectives. Four broad themes can be identified - Energy and Environment, Governance and Public Policy, Culture and Society, and Health and Wellbeing. Interdisciplinarity is a key principle of the research that TSU undertakes. We draw on the latest relevant developments in various disciplines and research fields. These include, but are not limited to, geography, transport studies, urban studies, sociology and economics. This is why the TSU's core team of researchers come from different disciplinary backgrounds. Our research across the four themes is characterised by a strong focus on cities and urban areas. These are now home to more than half of the world's population and accommodate the lion's share of transport journeys. They are the locations where the sector's problems are most visible and serious, but also the sites where most of the innovative solutions are developed, tested and implemented. Sustainability is another key concern. Much of our work tries to establish how mobility systems and practices can be made more sustainable through a wide range of initiatives, from system-level innovations in technology to behaviour change programmes tailored to specific individuals. The TSU's research makes use of different research methods and methodologies, including system modelling, qualitative methods and mixed-method approaches. Work in this research theme is concerned with reduced energy consumption, behavioural change and socio-technical transitions towards low-carbon, energy efficient transport systems. In an age of climate change, diminishing and unequally distributed natural resources and unstable energy supplies and prices, it is imperative to explore how dependence on fossil fuels can be reduced. People's everyday trips and practices and the social consequences of their (im)mobility are central to this research theme. The research concentrates on people's mobility against a background of societal transformations such as population ageing, changing gender regimes, the rise and diffusion of new information technologies, and growing income inequalities within and between cities and states. Research in this research theme is concerned with planning, policy and governance with regard to transport. Although transport policy analysis that derives from economic analysis remains very important, transport planning has become more politicised and policy increasingly must be understood as governance. Economic analysis therefore needs to be complemented with insights from other disciplines. The TSU is a largely self-funded research institute and most members of staff are contract researchers who are funded through external grants. The most important funding sources have been the European Commission and the UK Research Councils, including the Economic and Social Research Council (ESRC) and Engineering and Physical Sciences Research Council (EPSRC). Other bodies that are funding our research include programmes and institutes within the University of Oxford; research councils in other European countries; organisations such as the ADB, ASEAN, WHO, OECD and UN Habitat; and charities such as the Rees Jeffreys Road Fund. A small part of our funding is generated through activities other than research, including university teaching, executive education and consultancy. We are always developing projects and ideas for future research. The TSU has an excellent track record in collaborative projects and is keen to develop new partnerships with research groups and funding agencies.